A major project aimed at eradicating pests from Taranaki has been announced. An ambitious plan to eradicate pests from Taranaki will get an $11.7 million funding injection from Predator Free 2050 Ltd, Conservation Minister, Eugenie Sage announced today. Taranaki Taku Tūranga – a region-wide collaboration between Taranaki Regional Council and rural landowners, aims to eradicate introduced predators from native habitats. The project starts near New Plymouth and will be progressively rolled out across 4,500 hectares of farmland surrounding the Taranaki/Egmont National Park. The area will be defended from re-infestation by a ‘virtual barrier’ created by a network of intensive trapping. “Government funding of $11.7 million invested via Predator Free 2050 Ltd into Taranaki Taku Tūranga, aims to suppress or eradicate rats, stoats and possums in the area so our native birds and other wildlife can thrive. PF2050 Ltd is a government-owned charitable company established to support co-funding arrangements to help expand and upscale predator control operations. It aims to work towards a predator free New Zealand by 2050. “New Zealand has a predator crisis – 82 percent of native birds are threatened with, or at risk of extinction. We must invest in a comprehensive programme of predator control initiatives, to save Aotearoa’s indigenous wildlife,” said Eugenie Sage. “Taranaki Taku Tūranga will build on significant predator control work already being undertaken by the Taranaki Mounga Project – a large scale ecological restoration collaboration between Department of Conservation, eight Taranaki iwi, the NEXT Foundation and other sponsors, covering the 34,000 ha of the national park,” said Eugenie Sage. In late 2017, PF2050 Ltd issued a request for expressions of interest in collaborative landscape-scale predator control projects. Forty-five groups, representing six percent of New Zealand’s land area, expressed interest. In addition to the funding being provided by Predator Free 2050 Ltd, Budget 2018 provided an extra $81.3 million in new funding to the Department of Conservation (DOC) for landscape scale predator control as part of an extra $181.6 million in operational funding for DOC over the next four years. That funding allows DOC to plan ahead and target the pests that are devastating the habitats of New Zealand’s unique species. Predator Free 2050 Limited is responsible for directing a significant amount of Crown investment into the Predator Free Programme, with a focus on breakthrough science and large scale predator control and eradication initiatives. Predator Free 2050 Limited was formed in 30 November 2016 by the New Zealand Government via the Department of Conservation to realise New Zealand’s Predator Free 2050 goal. The company invests around $5 million per year in large landscape projects and scientific research, and leverages new funding to rid New Zealand of the possums, rats and stoats which threaten its unique fauna and flora. Its current science strategy is focussed on achieving interim goals for 2025. Predator Free 2050 Limited works closely with other parties in the Predator Free 2050 movement, including tangata whenua, the Department of Conservation, the Predator Free New Zealand Trust, New Zealand’s Biological Heritage National Science Challenge, Zero Invasive Predators Ltd, Sanctuaries of New Zealand, regional councils and community groups. It is good to see this continued by the new Government. It is a very ambitious plan for the country, as it is for Taranaki, which borders other areas that will leak predators into Taranaki unless they are controlled or eradicated as well. On April 12 the Government announced that there would be no more oil and gas explorations issued – No more offshore oil permits, existing permits remain. The Government was immediately criticised for a lack of consultation prior to the announcement, and the lack of details about how ‘transition’ from oil and gas might work. Andrew Little was quickly sent to a meeting in New Plymouth to try to do some damage control in a region that relies heavily on the oil and gas industry. The lack of consultation was raised again in Parliament yesterday. When questioned Minister of Energy and Resources Megan Woods said there had been “there were very strong signals” – but that isn’t consultation. Jonathan Young: When she described ending new offshore permits as a “planned, measured and careful transition … towards renewable energy”, did she actually tell anyone in the petroleum industry her plan to ban new offshore permits, prior to 12 April? Hon Dr MEGAN WOODS: This is a question that has been asked in this House and responded to in this House previously. What we have been very clear on is that both the Prime Minister and myself made very clear comments around the future of offshore drilling prior to 12 April. Indeed, two weeks before making that announcement, I went to the Petroleum Conference and gave a speech reassuring the sector that the changes coming would not affect their existing permits. Jonathan Young: Did she actually tell anyone in the petroleum industry prior to 12 April that she was planning to ban new offshore permits? Hon Dr MEGAN WOODS: As I just answered in the previous question, there were very strong signals. But we made an announcement; that was the point at which we told people in the petroleum sector. As that member knows, members of the sector received phone calls from myself, several colleagues, and officials the night before the announcement was made. Phone calls the night before a planned announcement is not great consultation either. Today prime Minister Ardern will meet with the oil and gas industry for the first time since the announcement. The Prime Minister is heading to New Plymouth today to meet with representatives from the oil and gas industry. It’s the first time she’s been to the region since the Government banned on any future offshore exploration permits. Jacinda Ardern says the focus of her meetings today will be on what needs to be done to help the industry transition. The industry has been very critical, saying they weren’t properly consulted by the Government, but Ardern maintains that’s not the case. Ardern and the Government have said quite a few things that they haven’t followed through on, or have deferred. They have cited the demands of being in a coalition as a reason for dropping or watering down some policies. It looks like Ardern rushed into the oil and gas announcement to use as show piece action ahead of a trip to Europe, but she should have done far better in New Zealand, especially in Taranaki. There will be pressure on Ardern today to assure the oil and gas industry that consultation on transition plans – if they have any plans of substance – will be given a far greater priority than sending signals via the media. While the Government has said they won’t issue any more oil or gas exploration permits and existing permits can still be used. With oil prices increasing there could be an increase in exploration in the short term. A flurry of oil and gas exploration is set to be unleashed in Taranaki during the next 18 to 36 months as companies make decisions on whether to ‘drill or drop’ existing permits. The schedule will see as many as 20 wells being drilled both onshore and offshore in the region before early 2019 as the price of oil steadily rises, to US$80 from below US$40 two years ago. A Petroleum Exploration and Production Association New Zealand (PEPANZ) spokesman said a decision would be made on a total of 31 exploration permits to be completed in Taranaki, as well as off the east coast of both the North and South Islands over the next three years. Todd Energy is well underway with preparations to begin drilling and hydraulic fracturing six new wells at the Mangahewa G site, north Taranaki, in late 2018. Contractors are finishing off laying the 4.5 kilometre gas pipeline from the site to the Mangahewa production station in preparation for the wells being drilled and fractured. The drilling and fracturing phase of the programme could see employment for up to 150 people. OMV, which recently acquired Shell New Zealand assets, is planning to drill nine offshore exploration wells during the 2019/2020 summer across six permits in the Taranaki Basin. The permits, granted to the company under the Crown Minerals Act, have a number of time-dependent exploration commitments and if successful further appraisal drilling, the step before production, would be considered, the PEPANZ spokesman said. It takes a lot of time and money to get from permit to production, but the existing permits may become more valuable if no more are issued. There were many mixed messages around the announcement last week that no more offshore oil and gas exploration permits would be issued (while the current Governbment remains in power at least). “We’ve stopped the rigs,” Green Party energy spokesperson Gareth Hughes said to his supporters. I’m left to conclude that last week’s performance was less about climate change and more a choreographed demonstration of the anti-oil and gas agenda within parts of the Government. Why remains a mystery, but at least we now know where Green Party Co-leader James Shaw really stands on the issue. Symbolic heads on pikes are more important than actual policy, apparently. When Shaw spoke last week of moving to a “fossil fuel-free future” by 2050 I suspect he really believed just that. No one in the world is predicting the end of hydrocarbon use – not the Intergovernmental Panel on Climate Change nor the International Energy Agency. We will use less for transport, but we will continue to need coal for making steel and oil and gas for all those handy products we use in our computers, aircraft, buses, trains, solar panels and wind turbines. The IEA continues to call for increased exploration and production investment to meet rising transport demand and to displace coal currently used for power generation and making chemicals and fabrics. With the global population forecast to increase by a third by 2050, the agency is concerned that supplies of all lower-emitting options are not increasing fast enough. But Shaw and the Labour Cabinet don’t seem to care. Nor do they understand the role New Zealand – already an oil and methanol exporter – could play supplying those lower emitting products. Worse than that, the Government appears actively determined that there should be no expansion of the industry here. Why else would you ban onshore exploration except in Taranaki? Surely we should be looking for gas and geothermal resources on the South Island so that coal-dependent industry there has lower-emission options alongside wood and electrification? Achieving real emission reductions is going to be complex. It will likely require industry- and regionally-specific interventions, some of which may be counter-intuitive. Incoherent policy rambling, grandstanding and cherry-picked anecdotes won’t cut it. So is the Government going to work with the oil and gas industry to utilise its skills to help reduce emissions? Were it actually focused on emissions reduction it might have allocated a bit more than the $150,000 it allocated for new energy initiatives among the $19.7 million it doled out in Taranaki earlier this month. $13.34m – Taranaki Crossing Experience. $5m – Taranaki Cathedral restoration and upgrades. $400,000 – SH43 business case. $250,000 – hill country tree planting business guide. $175,000 – regional ‘future food’ opportunities. $100,000 – Māori enterprise and education (focus on science, technology, engineering, arts/design, mathematics, innovation, and digital). $100,000 – ‘innovation precincts’ feasibility study. That was announced the week before the oil and gas permit announcement. Not a lot of alternate energy funding there. If the Government has an agenda to transition the country off fossil fuels then they need to treat alternatives seriously. There was immediate and strong criticism of the announcement that the Government would stop issuing offshore oil and gas exploration permits, and also onshore permits outside of Taranaki. Labour were seemingly in damage control Jacinda Ardern as sent Andrew Little to New Plymouth for an emergency public meeting. That didn’t go smoothly. Labour don’t look like they though through how the announcement might be received, how to deal with ‘the transition’, and what they should do about dealing with the flak. At the meeting in New Plymouth Little made some odd comments. He said it had been ‘a consultation announcement’, and the Government was keen to hear feedback on what was needed in the transition. Consultation after the decision had been announced. Andrew Little says the Government still wants to hear feedback from those affected by the decision to end oil and gas exploration. On Thursday night Labour MP Little held a public meeting at the Quality Hotel to discuss the impact of the decision with the community and industry in Taranaki. “This region is already suffering in the oil and gas industry because of the downturn…Leaders have been asking what’s next for Taranaki”. He said this was a consultation announcement, and the Government was keen to hear feedback on what was needed in the transition. “It is not a waste of your time…to come back and and say this is how it will affect us. A ‘consultation announcement’ that ‘took people by surprise’. Getting sent to a meeting in Taranaki seems to have taken Little by surprise, he didn’t seem well prepared. And he didn’t get a good response. Arun Chaudhari of the Taranaki Chamber of Commerce told Little most businesses had a consensus of opinion. “This region wants to see climate change addressed; we just think it’s a premature decision without proper consultation,” he said. Director of Arete Consulting Len Houwers said the news was a concern for major employers Methanex and Ballance. I don’t think the feedback Labour got yesterday will have been welcomed by their PR manangers. Ardern has famously said “climate change is my generation’s nuclear free moment”. This announcement has been poorly managed and seems to have blown up in her face. If Labour keep cocking things up like this they risk the voters going ballistic. Jacinda Ardern has announced that no more offshore oil exploration permits will be granted, something that will please the Greens, but she has made some short term exceptions for Taranaki (where most of our oil exploration is based), presumably to try to appease NZ First. Prime Minister Jacinda Ardern has announced an end to offshore oil exploration, with no new onshore permits outside Taranaki. Actually the way I read things it just stops new permits being given, existing permits can still be used. Russel Norman, the former Green Party co-leader who is now Greenpeace New Zealand’s executive director said the Government “has listened to people throughout the country who have campaigned for seven years to bring an end to offshore oil and gas exploration”. “The tide has turned irreversibly against Big Oil in New Zealand”. The industry has warned that ending oil exploration will do little to cut emissions in New Zealand or overseas, as the move will not affect demand or supply. We will just keep using oil drilled elsewhere in the world. All existing permits, some of which could continue to operate for decades, will be protected under the Government’s plans. So it doesn’t cut offshore drilling, it just rules out new offshore exploration permits, for now at least. This may be largely symbolic given that oil exploration companies aren’t rushing to drill in the oceans around New Zealand. But it is an important symbol for the Greens. One hundred and thirty two years after atrocities were committed and injustices imposed on the settlement of Parihaka the crown has officially apologised. The Crown has signed a Deed of Reconciliation with the Parihaka community in a ceremony held at Parihaka, Attorney-General Christopher Finlayson announced today. “In the second half of the 19th century, the Crown devastated Parihaka which at the time was the largest community in Taranaki and a centre for peaceful protest. imprisoning 405 Parihaka residents for their participation in the peaceful ploughing and fencing campaigns of 1879 and 1880 and promoting laws that breached natural justice by holding those protestors in jails without trial; invading Parihaka in November 1881, forcibly evicting many people who had sought refuge there, dismantling and desecrating homes and sacred buildings, stealing heirlooms and systematically destroying cultivations and livestock; and arresting and detaining Tohu Kākahi and Te Whiti o Rongomai, the leaders of Parihaka, for 16 months without trial. “Basic requirements of natural justice and the rule of law (which are the birthright of all New Zealanders) were denied to our citizens at Parihaka and they were left without any legal remedy,” Mr Finlayson said. “Signing this Deed of Reconciliation is a significant milestone for the Crown, Parihaka, the iwi and community of Taranaki and many others who believe in Parihaka’s legacy of peace. The Deed provides for a Crown support package of $9 million to assist Parihaka to strengthen its infrastructure and help the community achieve its aspirations. It also includes an agreement with Crown agencies and local authorities to work with Parihaka on development initiatives. Legislation will be introduced to record the history of Parihaka, the Crown’s apology and the commitment to a new relationship between Parihaka and the Crown. Parihaka is located in South Taranaki. It is closely affiliated to Taranaki Iwi and has connections with other iwi whose members sought sanctuary from conflict there. Parihaka is also connected with peace movements both in New Zealand and overseas. Parihaka, depicted in this painting by George Clarendon Beale (1856–1939), was New Zealand’s largest Maori community by 1881. Its prophets attracted followers from around the country. Te Whiti-o-Rongomai and Tohu Kākahi had established the pacifist community of Parihaka (formerly Repanga) in the shadow of Mt Taranaki in 1866. 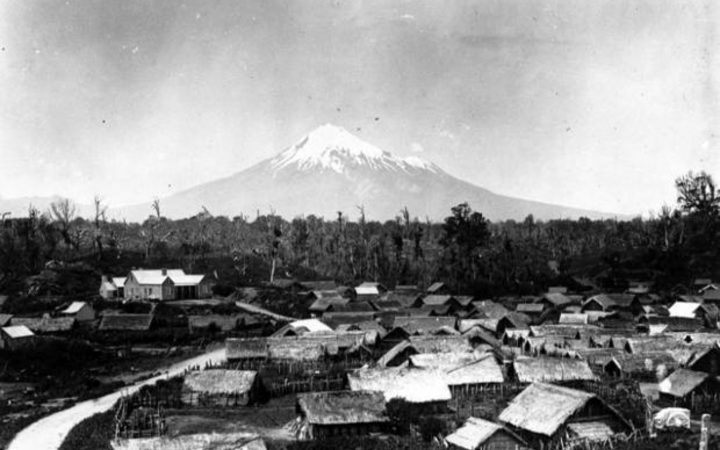 During the 1870s Parihaka became the largest Māori settlement in the country. Tītokowaru had developed a relationship with Te Whiti through his association with Te Ua. This relationship strenghtened through the 1870s. In 1878 the government began surveying the confiscated southern Taranaki lands for European settlement. In May 1879, under the initial direction of Tohu, Parihaka men went out to reclaim this land by ploughing it. Increasingly it was Tītokowaru who saw to the logistics of the protests. He was imprisoned three times. Tītokowaru’s presence was not lost on the authorities when plans were made to invade Parihaka in November 1881. Native Minister John Bryce took no chances, assembling a force of more than 1500 men. The settlement’s key figures, including Te Whiti, Tohu Kākahi and Tītokowaru, were arrested without resistance. Most of its inhabitants were driven away and Parihaka was largely destroyed. Much of central Taranaki now became Pākehā farmland. At the Green party AGM Metiria Turei launched a new (sort of ) policy to target ten rivers for cleaning up. A travelling campaign to highlight 10 major rivers in need of a clean up has been launched by the Green Party at its annual conference. Green Party co-leader Metiria Turei unveiled the campaign during her keynote speech, saying the Government needed to lift its “wadable” standards. But while the campaign was new, the policy was not. Turei said it wasn’t just Green Party members that were being targeted, it was an issue “of enormous importance” to all New Zealanders. In what appears to also be doubling as a data-gathering exercise, a new Green Party website requires petitioners to register with email addresses. “The best hope for our rivers is that we change the Government. Today’s petition is an opportunity for New Zealanders to demand rivers clean enough to swim in. The sewage-spill plagued Waitara river has made a list of 10 waterways around the country the Green Party wants cleaned up. Waitara has been plagued by sewage leaks this year, with three sewage discharges since February. In the Green Party’s campaign information it states the Waitara river is impacted by nutrients and sediment from dairy farming upstream. But its recent issue with sewage overflows haven’t gone unnoticed. “If you thought raw sewage going into rivers was a thing of the past, think again,” it says. Green Party claims that the Waitara River is so polluted it is unsafe for bathers have been described as “baseless” by councillors. But the claims were refuted by the Taranaki Regional Council during a meeting of its consents and regulatory committee on Tuesday. “The Green Party’s facts are totally misaligned with reality,” council chief executive Basil Chamberlain said. The council’s director of environment quality, Gary Bedford, said he could find “no factual base to the Green’s claims”. “We test the Waitara River every week during peak bathing season and have found it swimmable for 95 per cent of the time,” he said. Bedford stressed that the council’s water quality data was publicly available and audited by Niwa to ensure its accuracy. “It’s important to point out that if the bacteria levels reach even one point above the threshold it’s deemed at risk,” he said. Water spokesperson for the Greens Catherine Delahunty said the rivers selected in their top 10 didn’t necessarily represent the dirtiest in the country. “We wanted ten from different regions from around the country that showed the different types of threats and problems rivers are facing, but which also highlighted the potential solutions for cleaning them up,” she said. We’ve chosen 10 rivers to focus on, to find out what’s wrong and how we can clean them up again – we want your support for this campaign, can you add your name? We can do it! Aotearoa has the resources and the know-how to clean up our rivers and protect the wild places that we love. Our reward at the end of the hard work? The magic sound of a big splash and a shriek as that kid hits that sparkling, cold water. How could anyone argue against that? Taranaki Regional Council claim they have already done the hard work on the Waitara River.